Stress is a term that is very often used nowadays but it gets increasingly difficult to define. Poor organization, traffic, lack of exercise, suppressed emotions can all stress you out. No matter how much you have simplified your life already, stress does build up. Today, I am happy to host the master of eco-living, Debra Duneier, who I introduced to you back in November, with her book Eco-Chi - Designing the Human Experience. That book showed me so many ways to organize and design my home so as to attract harmony and happiness, and still be eco-friendly, that I keep on recommending it to my friedns. 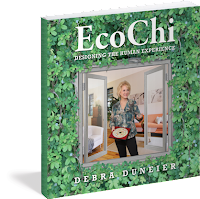 Since Debra is not only a talented writer, but also an accredited LEED® Green Associate, Certified Eco-Designer and a Feng Shui Master Practitioner I thought there is no one else who can teach us better about how to de-stress than her. When we connect with nature we feel happier and regain our natural rhythm. All of our senses become alive and we are reminded of our innate ability to heal ourselves. I created the EcoChi® system-because I was searching for ways to heal in my own life. I am excited to share this new concept with you blending both the ancient and the modern disciplines of Classical Feng Shui, Green and Sustainable Living and Environmental Psychology. Water soothes… so we love to be near water. After all, our own bodies are 70% water! People gather around fountains all over the world. The sound comforts us, the splashing delights us. We are reminded that we are a small part of something grand. Place a water fountain or fish bowl in your home. Be sure to keep the water clean at all times and enjoy! Indoor trees and plants are not only pleasurable to look at but also bring additional health benefits. Plants purify the air through the tiny pores in their leaves that act as air filters. There is nothing like the taste of home grown vegetables and fruits. What do you do if you have no garden? You can grow herbs and even some vegetables potted in organic soil near your window. They smell and taste great while they nourish and heal you. When your lives seem out of control, head outdoors! Plant your feet on the ground, raise your arms and take deep breaths. Consciously breathe in and out. You may even want to find a big old wise tree. Sit under it, put your hand on the trunk, smooth its leaves, feel its sturdiness and wisdom. This will help you to get back to your natural rhythm. For maximum health we all need to touch and be touched. Choose massage oil in a relaxing fragrance like lavender, sandalwood or vanilla. Warm it over a candle and massage your feet, legs and hands for a feeling of luxury and calm. Share your experience: Tell us which is your favorite method of dealing with stress. Yes, I love it too! The wonders of Internet, right? I am having the most amazing time, conversing with people like on all matters :) Thank you, Melinda! I try to get to the reservoir nearby as much as possible - even if just for 5 mins - as it's so calming to be somewhere quiet. I recommend finding somewhere peaceful as near by as possible so that you don't have the stress of getting there! Indeed, if you are to go through traffic and such, then there is not much point in it. But I am sure that the seeking will find! I love being by water. My dream is to have a little cottage on a lake. So relaxing. You are right, only after I started living by the sea I realized the power water has over us. I hope your dream will become a reality! Such great tips!! Fountains definitely create a great atmosphere, and my family eats organic and has tons of potted plants to clean the air. :) There's actually a little spider plant on my desk and a potted tree beside it as I type this! When I was a student I used to have a pot of violets on my desk. They were not only beautiful but also smelled enchantingly. One day I thought a bottle f sanitizer was water and watered the poor flowers. You can imagine the consequences. From that day until recently I've had a pretty estranged relationship with flowers as far as me caring for them is concerned..
Julia, aren't you a lucky one! You even get a massage, and in that you beat all of our scores, even Melinda's! Ooops, I forgot the fountain tough. Melinda, you now really have a most important task! You may regret having mentioned the fountain Melinda! We all want the "recipe"! Has anyone else noticed all the threads weaving in and out of the posts since we began our simplifying journey together? We have shared all kinds of ideas, but there are many similarities between them. I think I will re-read the posts this weekend and try and find 3 things that I would like to focus on for myself. Five is a good number, but we still have another week coming! Oh, you bet, Melinda, I am on the top of the world, cheering for all the connections being made! Plus, visiting your blogs and accidentally finding a comment left by any of you who before didn't know each other, makes me uber excited! Laurie, the depth that our commenting threads have added to the challenge is so impressive. I am re-reading them now, going through posts and making notes, however crazy this may sound. Remember your comment when you took the Simple Living Pledge? You cannot imagine how right you were - the whole experience so far has really been life-changing! Thank you for taking the challenge with me, ladies! Great tips! Easy to incorporate into you home and your life. You are so right about the cat and the dog, Elaine! I also read that cats feel where it hurts you and lie on the place to soothe your pain. And a glass of Merlot will definitely add some magic and antioxidants to a de-stressed after-massage body!